This is an amazing lounge, called the Tepoztlan Lounge, and is located in Tepoztlan which is a small town just south of Mexico City, Mexico. It was designed by the architects Cadaval & Solà-Morales. 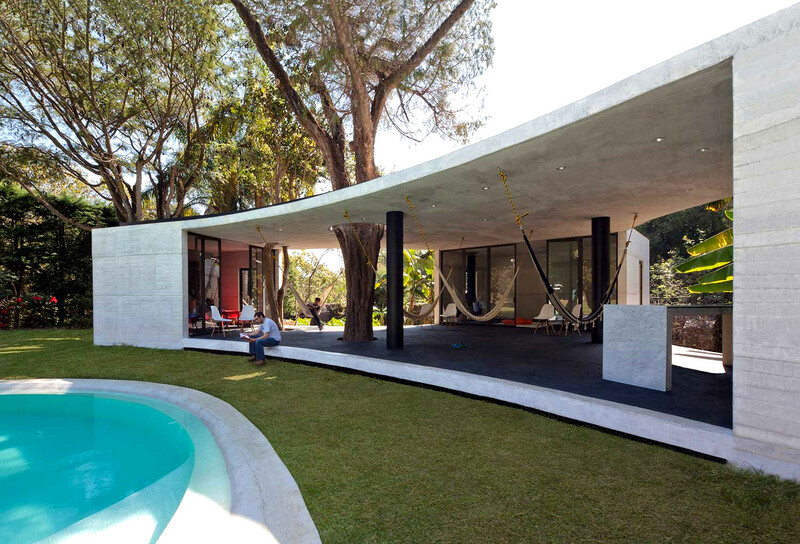 The lounge surrounded by nature, as well as being built allowing the existing trees to protrude through the concrete building. It represents a unique design in that the main aspect is to show an underlying respect for nature. The lounge shows that it is possible to make buildings that compliment and draw inspiration from the surrounding nature, as opposed to simply tearing down the environment in order to build upon it. The result is a beautiful and open environment where you truly feel one with nature. This lounge is great for working on any project that requires creativity to flourish, and I wouldn't mind working in such a lounge!